← How can Good Customer Service change the Face of Your Practice? With the Affordable Care Act (ACA), medical care has become accessible to many uninsured Americans. In California, it is estimated that there are nearly 750,000 people who remain uninsured. The continually growing population suggests that this number is only going to grow higher. As a medical practitioner your priority is to provide quality service for all your patients. This is where a medical billing company comes in service. An efficient medical billing service ensures that your practice is always fully reimbursed making it possible for you to offer your patients quality medical care. With the changing emphasis on value-based payment, healthcare organizations are faced with the challenge to reduce operational costs while still providing quality care services. Working with a medical billing company helps to both decrease operational expenses and to also increase revenue. More and more medical practices are beginning to see that outsourcing their medical billing services could be an efficient way to avoid penalties and scale down on costs – necessary factors to keep up with the changing norms and regulations. Apart from cutting down costs, a professional medical billing service can also help speed up the claims cycle. The 24/7 services offered by such companies is valuable in accelerating the revenue cycle of a medical practice. It is also helpful to note that the detailed financial information provided by a medical billing service is a major tool for medical practitioners to make accurate revenue forecasts, seal revenue leaks, and strategize carefully. Working with a medical billing service provider allows healthcare systems to eliminate the cost and effort necessary to train their own staff, along with the expensive billing software needed. Currently, the Health Insurance Exchange (HIE) also poses a hurdle for practitioners across California, as do the other changing rules and regulations of the medical industry. Medical billing practices assist healthcare organizations in keeping up with new changes. Further, unlike the fixed salaries of on-site employees, medical billing companies only charge a percentage of the medical practice’s overall collections. The correlation between billing costs and revenue is a major incentive for both medical billers to work industriously on your behalf, and for medical practitioners to ensure more value for money spent. Employing the services of a professional medical billing company is advantageous for both small medical practices, as well as large healthcare organizations. Small medical practices receive the much needed assistance in billing efficiently while still cutting down on costs required for computer equipment, billing software, office space, and fixed employee salaries. Large medical care systems, on the other hand, benefit from professional medical billing companies by saving up on labor and huge costs for medically necessary equipment. 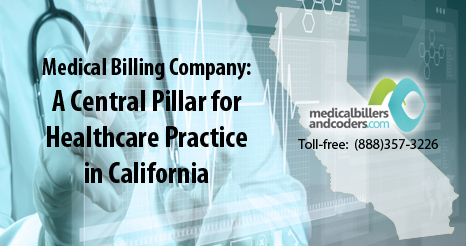 Either way, medical billing companies are a pathway for medical care services in California to increase revenue while cutting down on costs to ensure that their patients are given the best possible care. This entry was posted in Medical Billing and tagged Medical Billing, medical billing service, outsource medical billing service, professional medical billing, RCM. Bookmark the permalink.